Bourbon is getting increasingly popular, especially well-aged bourbon. The problem is, you can’t just whip up a batch of well-aged bourbon. It takes time. Literally decades. And yet many of the most sought-after bourbons are those of the extra-aged variety: Pappy Van Winkle 20 and 23, George T. Stagg, Eagle Rare 17, William Larue Weller, and Elijah Craig 20-22. While the suggested pricing of these bottles varies, unless you get lucky you can expect to pay hundreds of dollars for each of these limited offerings. There are lots of details and debate about the Orphan Barrel series bourbons, but one detail that caught my eye about Lost Prophet is that it was distilled at the George T. Stagg Distillery (now renamed Buffalo Trace). According to Whiskey Advocate, it was distilled with the same “high rye” mashbill as Blanton’s and Elmer T. Lee, two favorite bourbons of mine. 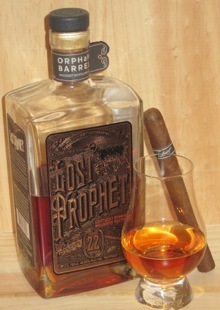 Orphan Barrel Lost Prophet 22 Year Old Bourbon is a deep copper color that shows the age of the 90.1-proof Kentucky bourbon. The nose is rich with baking spices, wood, and hints of caramel, though you wouldn’t necessarily assume it’s an extra aged bourbon. On the palate it really flexes its maturity. There’s intense oak, clove spice, vanilla, and leather. It’s got the woodiness that demonstrates its years, but isn’t as cloying as the previous Orphan bourbons.The spicy finish fades quickly on the roof of your mouth, but lingers on the back of the tongue. The bourbon’s traditional proof and finesse mean you don’t want an overly bold cigar. I recently reviewed the Illusione Fume d’Amour, and it’s just he kind of cigar you’d want with Lost Prophet: flavorful yet not full-bodied. Judging a $120 bottle of bourbon can be tough, especially when there are so many fine bourbons available, many for around $30. Still, Lost Prophet has a lot going for it as an excellent representation of why people seek out extra-aged bourbon. It just came out so there’s actually a chance of finding it on shelves right now. If this sounds good to you, move quickly.